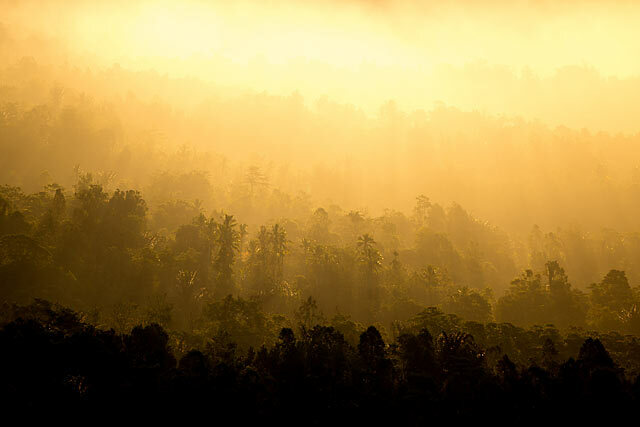 Being based in tropical Bali, we had become very accustomed to the coastal terrain offerings of the south. Low-tide beaches are our playgrounds and we know the trails through the terraced rice fields like the back of our hands. 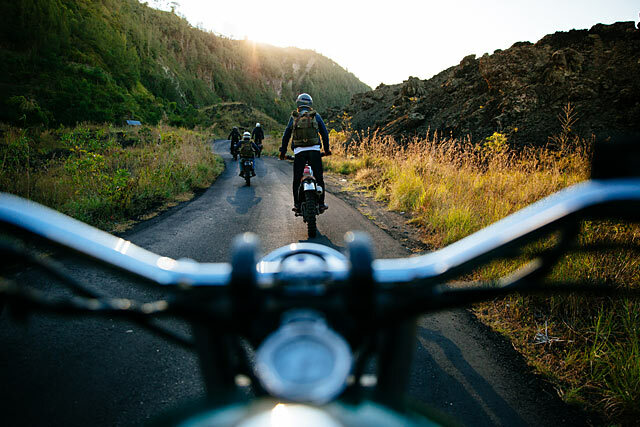 So when the opportunity for this trip arose to test out a batch of new custom motorcycles from our workshop, we decided to switch things up and point our compasses inland towards the island’s mountainous centre. Before we get into the nitty-gritty of the actual journey, let’s pause a moment and take a bit of a peek at the machines that took us there. 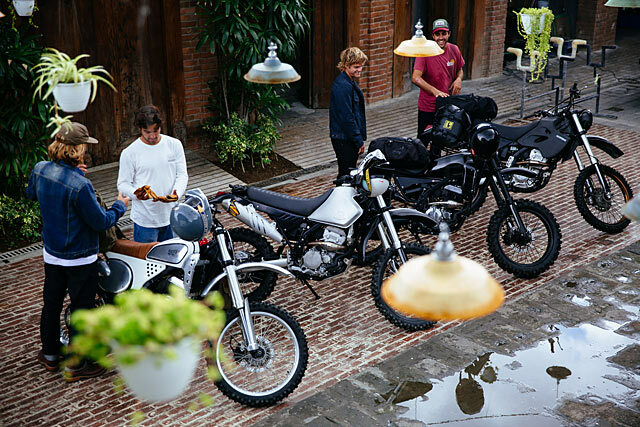 There were three custom builds done by our boys in the workshop down the back of the Temple backyard and then the fourth was a home-build by our good friend, Thomas, who joined us for the adventure. The three built under our roof took quite different design routes when it came to aesthetics. 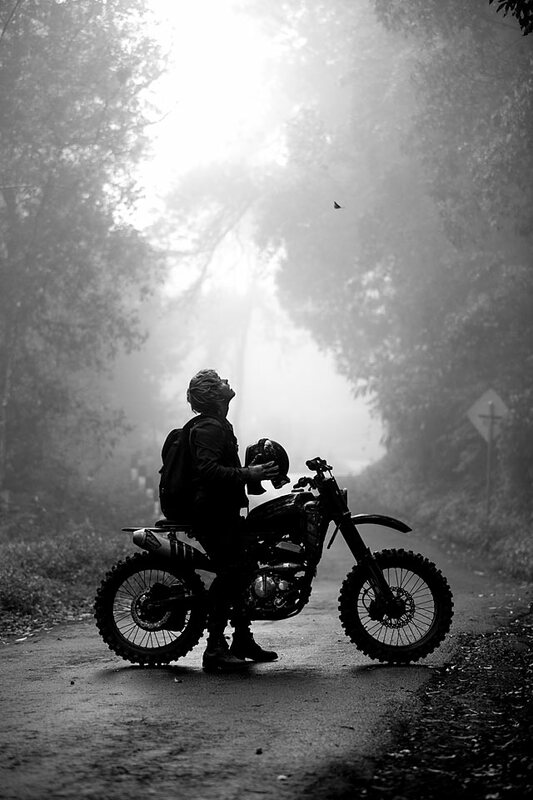 Although all the bikes began life as factory standard Kawasaki KLX250’s, this being the closest bike to a dual sport available to us here in Indonesia, each one stands on its own two tires as a custom motorcycle ready for touring the roads and trails we had in store for them. Before delving into each of the four builds we have to offer up a massive thanks to a couple of legends over at FMF. All the bikes were sporting Powercore 4 headers and exhaust that helped our lads to squeeze an often much-needed extra chunk of power out of the engines whilst sounding pretty damn good, all at the same time. First up, we have the one with a red and white tank and custom brown leather seat. 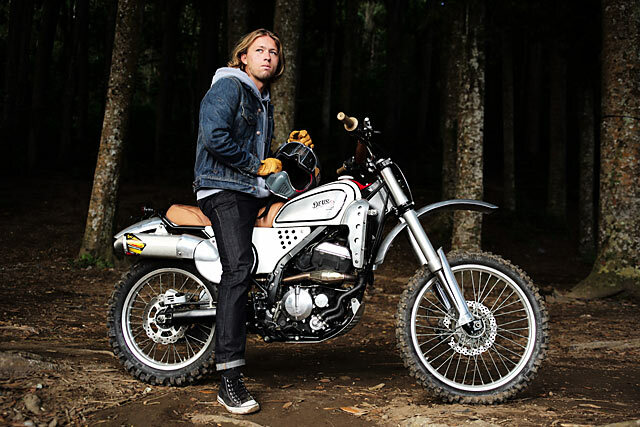 This bike took design cues from Vintage Motocross bikes. 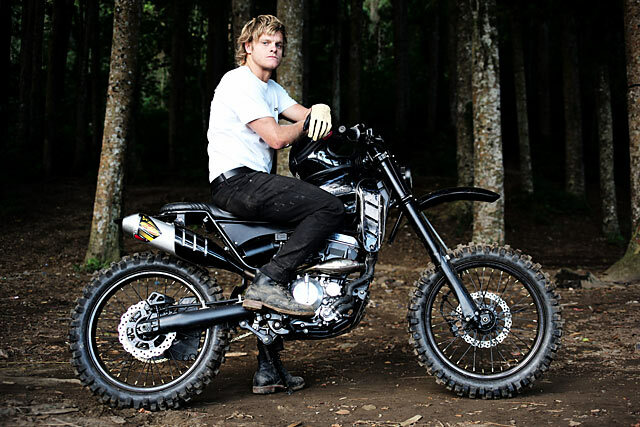 We kept all the functionality of the dual sport donor, but added a slew of custom pieces to it. We built a new sub-frame to alter its attitude. 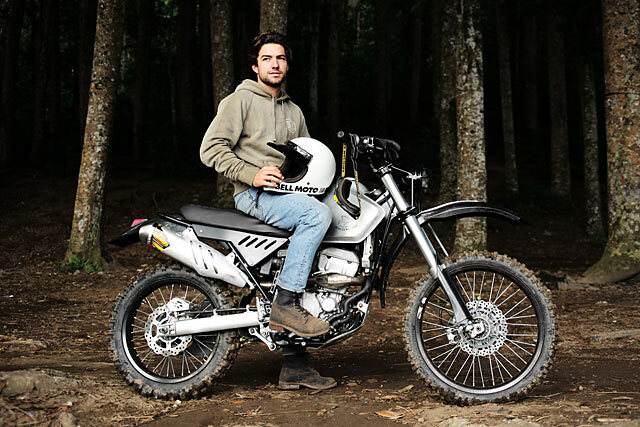 Both fenders and the tank along with the side covers and radiator protection are handmade from polished alloy; not everyone’s choice for hard off-road riding, but damn it looks good and it’s been performing great. It’s rolling an 18 inch tire in the rear with the 21 inch up front being steered by some repro vintage 7/8th scrambler handlebars we managed to find. We kept the tried and tested 250cc power plant stock, as we did the suspension. You know the old adage, if it ain’t broke, don’t fix it… and we’ll be damned if both of these didn’t work perfectly out the box. We did change out the factory sprockets on all the bikes to a larger 49 tooth by Pro Taper to give them a little more oomph in the low-end. Next up we have a black beauty. First thing that grabs you, after the murdered out paint job, is the symmetrical tire setup. 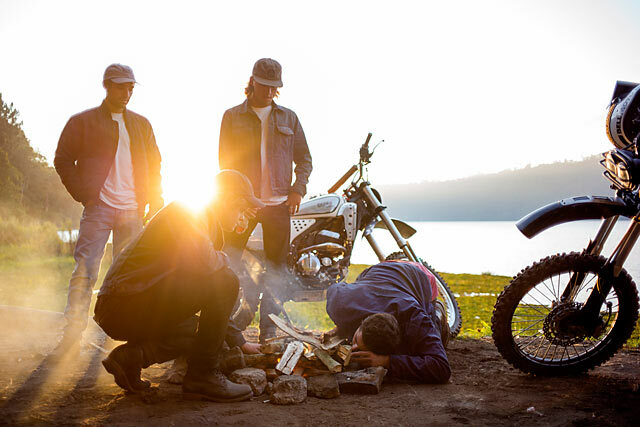 Now before you jump up and down and tell us this bike is probably better suited, style wise, to an urban street tracker than a long distance adventure rider… we know. What we also know is that at the end of each day it did exactly what we set out to do, holding its own with the others and looking slick doing it. The dual 19 inch Dunlops give it quite the stance and having a rear tire in the front didn’t affect the handling as much as we thought it might. We also had the boys bash out a handmade alloy tank along with fenders and radiator covers. The sub frame was ditched and started from scratch. We bolted on some Pro Taper Fat bars and, of course, one of our custom seats to connect the human to the bike. To punch through the darkness, we added a LED headlight. Last of the three bikes built in our workshop would have to be the one where our boys seriously outdid themselves in the aluminium fabrication department, producing an oversized brushed alloy tank that is faultless. As with its brothers in rubber, we constructed the subframe from the ground up to fit the lines we wanted. It’s got some vintage-style Acerbis fenders covering its 21 inch front and its 19 inch rear tires, along with a custom-made dual headlight on the front. Turning is taken care of with Renthal 997 bars that are perfect for the job of helping steer this steed through whatever terrain we came across. 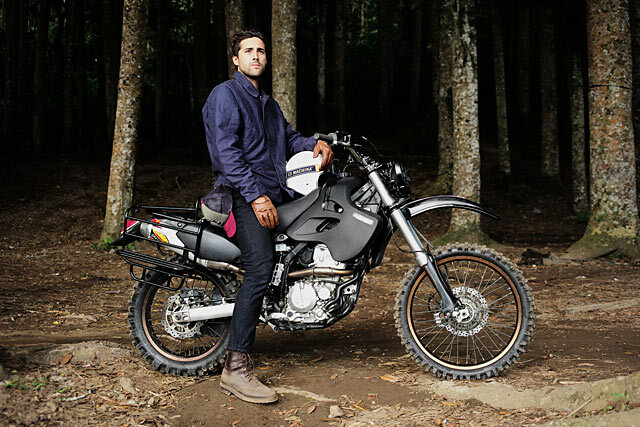 The seat was inspired by 90’s-era motocross bikes and definitely made it easy to move one’s weight around to handle those forest single tracks. The other motorcycle that joined us on the trip was actually a home-build by a good friend of ours, Thomas. 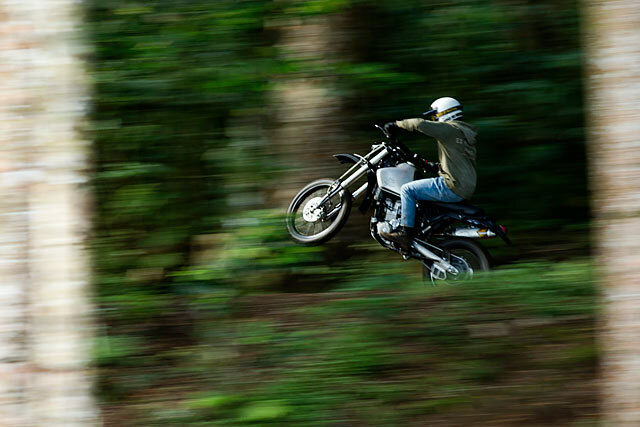 As fate would have it, he too had chosen a KLX250 as his foundation. He then added a long-range 18 litre tank from Acerbis. Since it was made for a Honda not a Kawasaki, it meant that as custom EFI housing had to be thought up and fabricated. That’s no mean feat. Tom added a couple of Hella Black Magic 500’s sitting in a sweet custom mount which really made his bike stand out, and shine out, in the early mornings and late nights. He then set about modifying his seat, fitting it in with a XR600 front & rear fender he just happened to have lying about. His vision was simple, it allowed him to fit a substantial luggage rack to be rear. This wouldn’t be the only trip he was planning to make. Just the first of a series. We were more than a little impressed at what he accomplished at home in his garage with only the help of a mechanic mate. 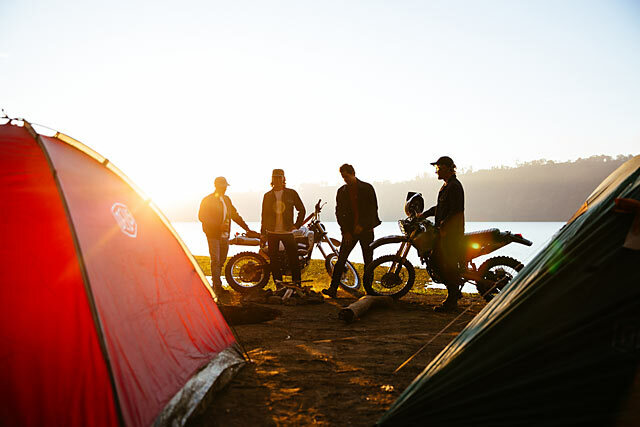 With his bike set up like that, as if it was just begging for some adventure, we knew we had to ask him to come along and just like that we’d found the perfect riding companion. “The air becomes truly clear of the sea salt and the urban congestion. Bird song replaces horns”. Now back to the trip. We didn’t really have much of a plan other than to head to higher grounds. We all agreed we should be searching for some cooler climates, something a little more agreeable than the thick humid air hanging around the coastline… So that’s exactly what we did. We made a left turn out of the Deus Temple of Enthusiasm in Canggu and just kept heading inland. A couple of hours put us where the houses grow further apart and the road rises. The air becomes truly clear of the sea salt and the urban congestion, bird song replaces horns, all the while we were rising steadily through switchback after switchback. We were headed to a lake we heard offered a chunk of reasonably flat dirt we hoped would be enough to pitch our tents on for the night. We reached the point where the road began its descent back down again. Dropping over the other side was like walking through a portal. Gone were any sign of the tropic island we were on. Tall pines hugging the hill side towered high above us, leading the way towards the lake. Moss covered the stones by the side of the road and everything was kind of wet to the touch. It grew denser before finally opening up at the patch of dirt we would call home for the night. We were all very animated, first stretching our legs then unloading our bikes and setting up our camp. It took no time at all as we were all itching to jump back on the unladen, lighter bikes and set out to exploring the surrounding forest. We spent the rest of the afternoon dodging stumps, picking lines and kicking up fallen leaves and before we knew it the sun was going down and with it the temperature. We headed back to the camp to get the fire going and mull over the day’s events with beers in hand. After a beautiful, yet very cold, night under the stars and not wanting to get stuck in one place we rose with the sun, pausing only to fuel ourselves with coffee before packing up shop and pointing our bikes towards the peak across the valley. Thomas had been there before and knew of place for us to rest our heads. So with him in the lead we set off single file along the tight foot tracks for a few hours until it was time for a break. As luck would have it we happened upon a local roadside eatery and as we stuffed anonymous snacks into our mouths. Watching us eat, the owner told us of a nearby waterfall. With nothing pressing on our schedule other than making it across the valley before sundown, we decided that a dip in the frigid mountain waters would be a good way to wash off the adventure musk of past couple of days. We left the bikes with the snack selling old man and hoped that his vague hand gestures would be enough to guide us down the hillside. After a couple of unwanted river crossings and a few pairs of wet boots later, we found the falls and spent the next few hours relaxing whilst discussing and admiring the sheer amount of raw energy cascading into the pools before us. When we ascended, we had mud on our feet and smiles on our faces. We thanked the old shop keeper, bought a bag full of his snacks, climbed upon our steeds and rode until we reached the spot to be our shelter for the night, arriving just as the sun was getting ready to set. Next morning we rose with the light creeping up behind the volcanos on the horizon and went through the familiar process of packing our clothes and hitting the road. This time we decided to head to even higher altitudes and with nothing but exhaust notes burbling behind us we ascended until we hit the ridge-line of a large series of cliffs at the edge of a volcanic region. It was just before midday and we weren’t going to head back to the coast anytime soon. Instead we consulted our map to see if there were any off-road trials we could occupy ourselves with before again finding somewhere to hold up for the night. 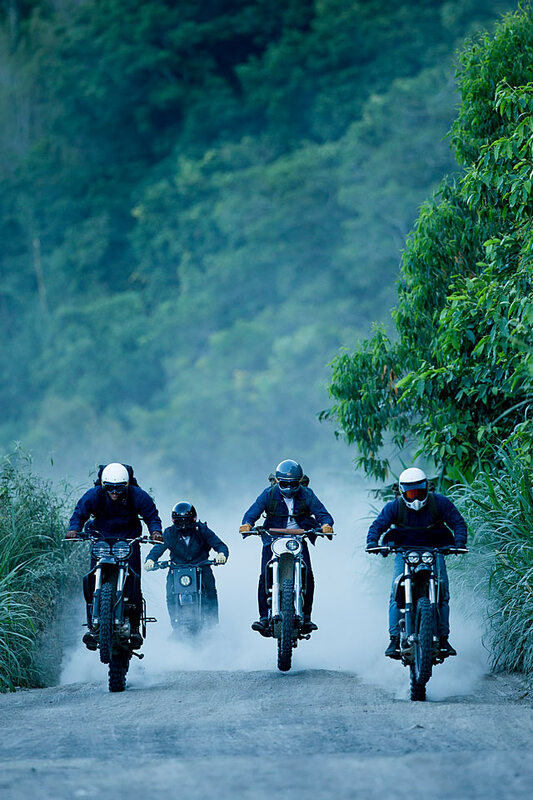 We wanted to get off the beaten track and ended up doing just that. We could see that there was a trail linking a couple of paved roads that looked promising. So, we threw caution to the wind and headed in that direction. It was soon evident that the mellow single track we had started on was leading us down a path we couldn’t really turn back on. We followed the creek down the valley until we could go no further. The terrain we’d wandered into was in fact a little too much for the 250’s. Just after getting the bikes all free and wondering what the hell we were to do a local farmer appeared out of nowhere and showed us a route back to the main road. We headed into a little town nearby to find some food, a warm shower and shelter for the night. “It was soon evident that the mellow single track we had started on was leading us down a path we couldn’t really turn back on”. The next day we were in the saddle long before the sun rose. We had a big day of riding ahead of us with next to nothing known about the road conditions ahead. For a while our headlights led us through the dense forest. Blackness was absolute and all around, each of us following the trail set out by the rider in front. When the sun finally rose, so did a huge cloud of mist that rode with us for the rest of the morning. Cold and wet, making our way through the trails was more than a little difficult. 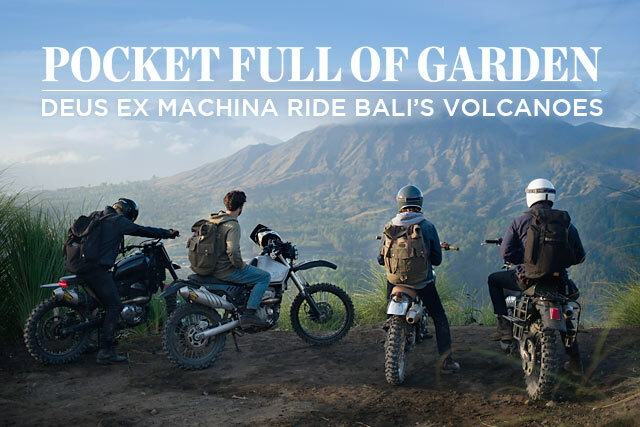 Our compass was set for the highlands of volcanic Mount Batur, a place where we knew a great moto playground awaited us. 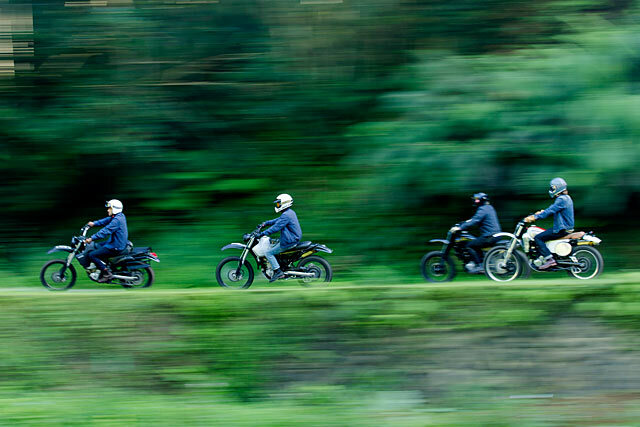 Here we found a park of dusty trails where we could really test the handling of our motos. Granules of a volcano had been spat out and laid down to make a bed that is perfect to ride on. The mist lifted with the heat of the day, as did our moods, and we once again adopted a devil-may-care attitude leaving dust trails in our mates’ faces as we played a game of tag across the mountain side. Smiles were abundant, even under the full face helmets, and the joy of riding visited all of us. I guess that’s what it’s all about, isn’t it? All in all, our goals and expectations of going inland and disappearing on bikes were beat and bested. For some, this had been personal challenge about doing things for the first time or for betterment, while for others it was more about the experience of the place and the adventure. With legs that were numb, we followed the setting sun and headed homeward back to the Temple. Thoughts went inward as we descended and the houses once again grew closer together and the warmth crept back into our bones before we began to sweat for the first time in days. The thought occurred, at least to me, that a week on a bike in the mountains should be on everyone’s to do list. How about yours?